Researchers have identified a potential way to prevent chronic urinary tract infections (UTIs). Their research points to a key protein that bacteria use to latch onto the bladder and cause UTIs, according to scientists at Washington University School of Medicine in St. Louis. Vaccinating mice against the protein reduces the ability of bacteria to cause severe disease. The study, published Sept. 22 in Cell Host & Microbe, suggests that targeting this protein may prevent the most serious consequences of a very common infection. “Our findings reveal how bacteria have evolved a mechanism to colonize the bladder in order to persist and cause UTIs, and our vaccination study suggests that inhibiting this mechanism could be part of a viable approach to treating or preventing these infections,” said Scott Hultgren, PhD, the Helen L. Stoever Professor of Molecular Microbiology and one of the study’s senior authors. UTIs are one of the most common infections, accounting for 8.1 million visits to health-care providers in the United States every year. Women stand about a one-in-two chance of contracting one over their lifetimes. About 80 percent of UTIs are caused by Escherichia coli (E. coli). Acute UTIs are characterized by frequent painful urination and abdominal or back pain and typically are treated with antibiotics, although multidrug resistance is a growing problem. Untreated – or untreatable – chronic infections allow a pool of bacteria to survive in the bladder and possibly spread to the kidneys or the bloodstream, where they can cause disease severe enough to require hospitalization. To avoid being swept away during urination, E. coli attaches to the bladder with long, hairlike projections called pili. One kind of pilus, called type 1, is necessary in the early stages of infection. Another research team identified a second pilus, called Fml, with genes that are strikingly similar to the type 1 pilus but whose function had been unknown. As part of the current study, Hultgren, postdoctoral researcher Matthew Conover, PhD, colleagues Ségolène Ruer, PhD, and Han Remaut, PhD, of Vrije Universiteit Brussel in Belgium, and others set out to determine the function of the Fml pilus. They focused on a protein known as FmlH, which they believed was located at the tip of the pilus, where it would help bacteria stick to the bladder wall. The researchers removed the gene for FmlH from E. coli and then infected the urinary tracts of mice with bacteria with and without the gene. 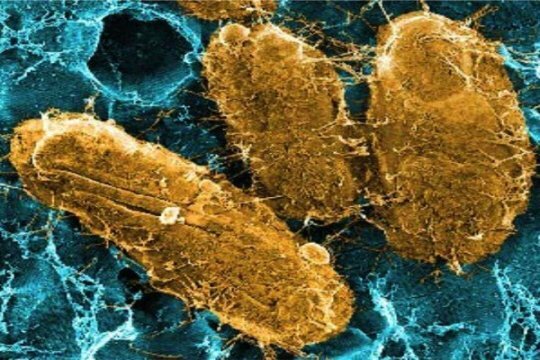 They found that E. coli lacking FmlH were less likely to establish chronic infections in mice than bacteria with the protein. In the first few days of the infection, the two strains multiplied to similar levels. But by the end of the fourth week, the bacteria without FmlH were 1,000 times less numerous in the bladder and 100 times less numerous in the kidneys than the bacteria with the protein. “We found that the Fml pilus plays little to no role in acute bladder infection, but after the establishment of infection and the onset of inflammation, it contributes to the persistence of bacteria in the bladder,” said Conover, who led the study as a researcher in Hultgren’s lab but now works for iCubate, a biomedical company. Further, the researchers showed that FmlH could bind to human bladder cell lines, indicating that the results they saw in mice may be applicable to humans. “Taking biopsies of human bladders during a UTI would be contraindicated because of the risk of spreading the bacteria, so the cell lines are the best model of human infection we have,” Conover said. UTIs are becoming increasingly difficult to treat as multidrug resistance becomes more common. Vaccination could be part of a strategy to prevent recurrent and chronic infections. The researchers gave a group of mice two doses of vaccine made from a piece of the FmlH protein, four weeks apart, and another group of mice mock vaccinations without the protein. Then, they infected both groups with E. coli and measured the amount of bacteria in their bladders and kidneys one, two and three days after infection. On the first day, there was no difference between the mice that received the vaccine and those that didn’t. But by the third day, the unvaccinated mice had more than 1,000 times more bacteria in their bladders and 100 times more bacteria in their kidneys than the vaccinated mice. The above post is reprinted from materials provided by Washington University in St. Louis. The original item was written by Tamara Bhandari. Note: Content may be edited for style and length.